She was considered to be „the most beautiful princess of Europe;“ so in any event reported a French diplomat back to Paris. The male aristocracy of her time lay at her feet. Friederike enjoyed such admiration and also her grand lifestyle. She married three times and granted her favor to many more admirers as well. Friederike Karoline Sophie Alexandrine von Mecklenburg-Strelitz was born on March 2nd, 1778 in the „Old Palace“ across from the Leineschloß / (Leine Castle) in Hanover. She died, age 63, in the same room on March 29th, 1841. After the early deaths of her mother and stepmother Friederike grew up with her grandmother, the Landgravin Luise of Hesse-Darmstadt. Her father, Governor in Hanover on behalf of the English King George III, had placed his two youngest daughters in her care. From this time on a close bond existed between Friederike and her sister Luise, two years older than she and later the Queen of Prussia. 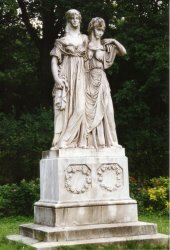 The Berlin sculptor Johann Gottfried Schadow represented the two sisters as nestling against each other in a charming double portrait. The original is located on the Museum Island in Berlin; a larger than life copy stands in Hanover, on Hohenzollernstrasse. Although it portrays them as princesses, it is called the monument of the queens. Both young women had the reputation of being extraordinarily beautiful and charming. For this reason they caught the attention of the Prussian King Friedrich Wilhelm II, who referred to them as „the two angels“ and regarded them as suitable matches for the crown prince and his brother. He had the engagements arranged, and at Christmas, 1793, the double wedding took place in Berlin. Luise’s husband would later become King Friedrich Willhelm III of Prussia; the 15-year-old Friederike married his younger brother Ludwig. Friederike’s alliance with Ludwig, who was called Louis, was not a happy one. Her husband hardly took notice of her. She nevertheless fulfilled her „conjugal duties“ and bore three children in three years. When Ludwig died of diphtheria in 1796 she felt more shaken than grief-stricken. The fun-loving and flighty young princess soon turned to other handsome cavaliers and was reported to have had affairs. On January 7, 1799 Friederike wed Friedrich, Prince of Solms-Braunfeld. Soon after, on 27 February, she gave birth to a daughter, who died a few months later. Friederike never revealed the true identity of the child’s father. This marriage was also not favored by fortune. Solms suffered from an emotional disorder, presumably depression. He repeatedly abandoned the military post which Friederike had obtained for him through her sister Luise’s influence with the Prussian king. In January 1814, after the parties had reached an agreement concerning finances and the rearing of the four children they had together, the marriage was dissolved. Friederike was 37 when she began her third marriage, in 1815. After her divorce she was no longer considered a particularly „good match;“ she was nonetheless courted by Ernst August, Duke of Cumberland. He had been one of her genuine admirers when she was young and was now, at 44, still unmarried. A scion of the House of Welf (or Guelph), which then held combined rule over Hanover and England, he alternated stays in the two countries without having the prospect of a political career himself. Several deaths in the royal family and the differing laws of succession in England and Hanover, however, would change the course of history. On 20 June 1837 Victoria ascended the throne of England, thereby ending the combined rule of the two lands. Ernst August became King of Hanover, and Friederike a queen in the city of her birth. With the birth of their son Georg in 1819 the couple’s happiness had seemed complete. But Georg suffered from an eye disorder and eventually went blind. As long as she lived, Friederike continued to hope for a cure. Friederike was Ernst August’s „one and all,“ and he never got over her death. He gave his master builder Georg Laves the task of constructing a mausoleum for himself and his late wife in the garden of Herrenhausen Palace. In addition, he promulgated a royal edict calling for the redesign and renaming of a central square in the vicinity of the Leineschloß in honor of Friederike. The nearby „Friederikenschlößchen“ (Little Palace of Friederike) was demolished in 1966. The hospital founded by Ida Arenhold was also named „Friederikenstift“ after Queen Friederike. Brinkmann, Jens-Uwe (2003): Friederike, Königin von Hannover. Karwe bei Neuruppin: Ed. Rieger. Ditsche, Uta (2004): „Jeder will sie haben“. Friederike von Mecklenburg-Strelitz (1778-1841). Regensburg: Pustet. Kühnel, Klaus (2004): Die galanteste Löwin des Jahrhunderts oder Mein verlorenes Gesicht. 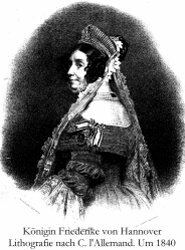 Prinzessin Friederike von Mecklenburg-Strelitz (1778 - 1841). Ein biographischer Essay. Berlin: Trafo-Verl. 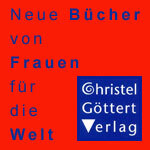 Raabe, Katharina (1997): Deutsche Schwestern. Vierzehn biographische Porträts. Berlin: Rowohlt Berlin. 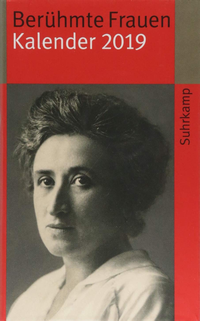 van Taack, Merete (1987): Friederike, die galantere Schwester der Königin Luise. Im Glanz und Schatten der Höfe. Düsseldorf: Droste.